On April 4, the North Atlantic Alliance will celebrate its 70th anniversary. Foreign ministers of all 29 member states, with a 30th member to be the Republic of North Macedonia, will gather in Washington, D.C. where seven decades ago 12 European and North American leaders signed the North Atlantic Treaty. For seven decades, NATO brought unprecedented peace and stability to its member nations and their citizens. The transatlantic bond has remained a cornerstone of mutual security and prosperity, thus allowing Allies to live in freedom. And while there have been differences among the Allies over the years on a number of issues, they always overcame them as the main goal of peace and stability remained the guiding principle. From its creation, NATO has been conscious about its need to communicate to its citizens what it stands for. This is why on May 17, 1950, the North Atlantic Council, NATO’s highest decision-making body, issued a resolution in which it committed itself to “…promote and coordinate public information in furtherance of the objectives of the Treaty while leaving responsibility for national programs to each country...” In August 1950, NATO’s Information Service was established. From its creation, NATO has been conscious about its need to communicate to its citizens what it stands for. In 1956, the Three Wise Men Report identified the need to further enhance NATO’s non-military cooperation and coordination activities, including a more robust public information program through cultural projects, foreign exchanges, seminars to teachers, distribution of educational materials in schools, fellowships and academic chairs as well as tours of journalists. And, so, NATO’s public engagement began. Understanding the importance of reaching out to ordinary citizens, the first traveling exhibition, called the “Caravan of Peace” and consisting of a large tent and an expendable trailer, set off in 1952 from the NATO Headquarters in Paris to make its way down to Italy. It was an immediate success and in 1952 from February to August, 1,542,815 visitors flocked to the exhibition in Naples, Rome, Bologna, Milan, Bari, Genoa, Turin, Florence and Venice. Over the next 15 years, the traveling exhibit was renamed the Mobile Information Center and, consisting of two NATO buses, made its way through all of the then-member states. 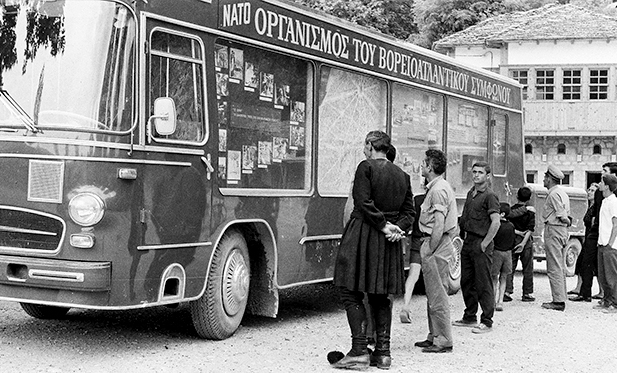 NATO "information buses" toured Europe during the 1960s and 70s to answer questions in-person about the alliance. These buses doubled as mobile movie theaters, seating up to 50 people inside. Learn more here. NATO and its leaders became more accessible to the outside world than ever before. All major NATO events carry a press component and often a public engagement component—major public diplomacy events became a norm to every NATO Summit. At the sidelines of NATO’s Foreign Ministers meetings in Washington, D.C., NATO organizes with a set of partners a high-level conference on April 3–4 titled #NATOEngages. It will bring together over 300 policymakers, experts and journalists with NATO leadership to discuss the most pressing issues for the Alliance today as well as to review its past. Rarely does the NATO Secretary General travel abroad without having a series of interviews and a public speech with local partners. Press tours to NATO Headquarters and to NATO’s missions and exercises are a norm. The average number of officially accredited journalists to a NATO Summit is close to 1,500. Social media platforms cater to different audiences with different content. The official NATO Facebook page has over 1.3 million followers and the Spokesperson’s Twitter is followed by almost 60,000 followers. Visitors flock daily to NATO Headquarters for briefings and meetings with NATO officials, and the iconic image of NATO’s new headquarters welcomes travelers arriving at the Brussels International Airport. The NATO story and symbols are woven into the fabric of the building. The building itself is designed to represent the fingers of two hands entwined in a gesture of protection, representing the mission of the Alliance. At the main entrance to the building, visitors and staff are greeted by two reminders of NATO’s mission. Two segments of the Berlin Wall illustrate visibly the role NATO played during the Cold War, including its ultimate success in tearing down the Wall. A steel beam from the 107th floor of the World Trade Center 1 in New York City is the reminder of the role the Alliance plays in the fight against terrorism. The monument commemorates the only time in the history of the Alliance when Article 5 of the North Atlantic Treaty was ever invoked in the defense of one of the Allies, the United States, after the 9/11 terrorist attacks in New York and Washington, D.C.
On the eve of NATO’s 70th anniversary, NATO’s communications have come a long way. It is a story of a vision and strong belief by NATO’s leadership over the decades that our citizens deserve to be informed and aware of NATO’s decisions and actions. Whether through networks of key opinion-formers and experts, engagement with a young generation of future leaders, the never-stopping 24-hour news cycle or the use of digital media platforms, NATO remains true to the words of American President Harry S. Truman—that we are a group of householders bound by the same interest of keeping our neighborhood safe.